A typhoon hit South Korea on June 25 and 26, 2011, bringing heavy downpours and gusts and signalling the start of the rainy season. At least nine people were killed and a bridge and a levee collapsed. Moreover, a leakage was reported on a landfill where livestock was buried during the foot-and-mouth disease outbreak. The rainy season is from late June to early July in Korea and about two more typhoons are expected to pass the Korean peninsula. Though typhoon ‘Meari’ of June 26 has managed to disrupt few places, people have voiced concerns that this typhoon is merely a premonition of unfolding disasters in a country where several hundred landfills are perched near a river and rivers are unstable due to the government's river project. The mass killing of livestock to slow down the foot-and-mouth disease (FMD) started in December 2010. A quarter of the country's cattle and numerous pigs and ducks were killed and some dumped alive, creating several hundred landfills as a result. ‘FMD landfill leachate’ leaked during torrential downpour. Link to a related news article. Worries have eventually become reality. TV writer @borabay criticized [ko] the government for not taking actual measures. The FMD landfills left unguarded are now on red alert. We have expected this to happen but hoped for a fluke, thinking ‘it (landfill) will somehow manage to withstand’. The FMD… It is the price of treating lives lightly. A curse unfolds as the monsoon downpour starts. […]공포영화 시나리오 하나 떠올랐다 구제역으로 죽은 돼지와 소들이 장마때 갑자기 땅속에서 나와 사람들을 잡아먹기 시작하는 영화 무능력한 정부와 사람들의 갈등을 양념으로 풍자와 유머가 있으면 나름 먹힐지도? I've got a great horror movie idea. There could be a movie where dead pigs and cattle slaughtered over FMD suddenly pop up from the landfill and start devouring humans… If we spice it up a little with a story of conflict between incompetent government and citizens and add a zest of sarcasm and humor, then it may sell well. Collapse of one monumental bridge during the typhoon has sparked accusations about the government's ‘Four Major River Project‘. The Four Major Rivers Project which proclaims itself a multi-purpose green growth project on four major rivers is now highly unpopular among the Korean public for both financial and environmental reasons. A total of 22.2 trillion won (near USD 17.3 billion) is officially earmarked for the project and the re-channeling or straigthening of rivers and streams has drawn intense criticism. 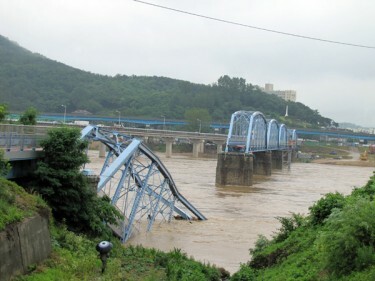 The Hoguk Bridge collapsed on June 25. The bridge was the last defense line on the Nakdong River during the Korean War. The fact that this symbol of national defense collapsed on June 25, the exact date the Korean War broke out, panicked people. Local residents and South Korean Twitterers blamed the government for pushing the river project despite concerns and the project's excessive dredging work. According to a local report, excessive dredging on one side may have weakened the base of the bridge and heightened water pressure. Many stressed that this incident is a man-made disaster since the the bridge had endured stronger typhoons and intense monsoons over several decades. 제 기억으로 교각이 붕괴된 곳은 <소>가 있어 수심이 깊은 곳입니다. 반대편엔 퇴적이 이루어지던 곳이죠. 소가 있는 부분은 물이 불어나면 유속이 빨라지죠. 그런 곳을 보강하지 않았으니 4대강사업이 얼마나 졸속으로 이루어지고 있는지 알 수 있네요. As long as I remember, the part where the bridge collapsed is the spot where water runs deep because there used to be a pond underneath it. On the opposite side, a natural bank is formed. When the water rose, water flow increases near the pond area. They should have bolstered the weak spot. It tells how poorly the river project has been done. According to KBS news, the construction company contracted for the river project had dug deep at the base of the bridge. We should respond with reasons. Emotional response is unseemly. Nakdong River's Sangju reservoir's main levee is collapsing down like a glacier wall. It is so scary! The seasonal downpour started in South Korea on June 28 after the typhoon moved to North Korea on June 27. Net users expressed concern over the safety of the impoverished North Korean people and how would they weather devastating rains and strong winds.